BRIGHTON, Mich. - Since 1974, Ford Fund has contributed nearly $9.3 million to veteran organizations and this year Ford Motor Company is donating seven vehicles to the DAV Transportation Network. 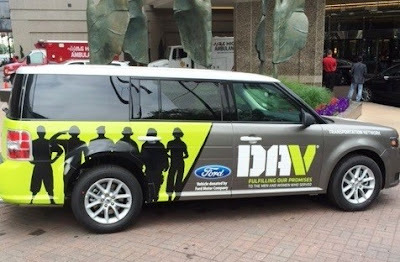 Ford will donate seven Ford Flex utility vehicles to the DAV which will become part of the DAV Transportation Network that enlists volunteer drivers to take sick and disabled veterans to VA medical centers across the country. The vehicles will be deployed to multiple DAV locations around the country including Little Rock, Ark. ; Iowa City, Iowa; Iron Mountain, Mich.; Omaha, Neb. ; Portland, Ore.; Salt Lake City; and Seattle. Along with the Flex utility vehicles, the Ford Fund will be sponsoring DAV 5K walks this autumn in Atlanta, Cincinnati and San Diego and will continue supporting the Jesse Brown Memorial Youth Foundation which provides scholarships to young men and women who have volunteered their time to help the disabled veterans of their communities. Ford Motor Company is donating seven vehicles to the DAV Transportation Network this year while Ford's support for veterans continues to evolve to meet their changing needs. Jim Vella, president of Ford Motor Company Fund and Community Services stated, "Transportation and community service are two important areas where Ford excels. We are proud to be able to help these heroes of freedom get the critical services they need to make their lives better." For more information on how Ford Motor Company and Brighton Ford are changing their communities for the better, visit our Community Involvement page today! We believe in the community we live in! Looking to get your vehicle checked out before you hit the road for those final summer road trips? Stop by our Howell Area Car Repair Center today! Brighton Ford is located at 8240 Grand River Ave. just north of I-96 in Brighton. We are a family owned and operated business that strives for customer satisfaction. For more information on Brighton Ford visit BrightonFord.com or give us a call at (800) 836-8206.